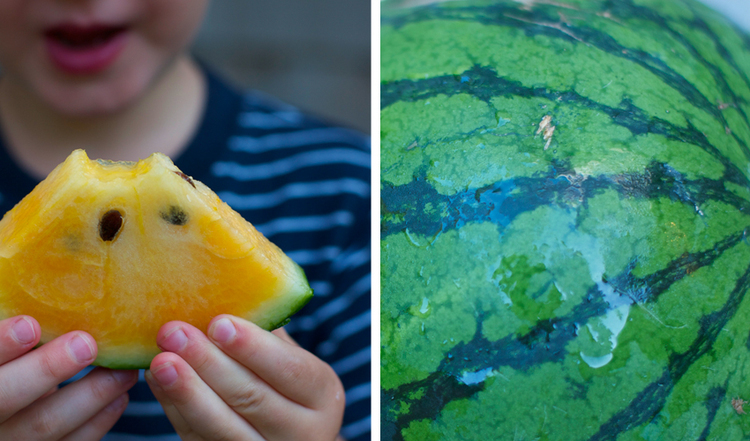 It's round two for watermelons this week! These are an orange variety called "New Orchid" and I think I'm in love... We have cabbage again this week, chard is back and we're welcoming the first harvests of our red beefsteak tomatoes and peppers! Last Friday's crazy rain and flooding was a surprise, but so far it looks like our crops weathered the storm pretty well. Farmer Matt had just seeded a round of carrots and beets the day before, so we're still not sure if they survived the flooding and will germinate. If not, we'll have to re-seed them again. The same thing happened last August, which is why some of our root vegetable crops were delayed. Otherwise, all is well here on the farm. It looks like a beautiful week of weather coming up! Storage: In the refrigerator! Uses: Raw. When to use: Now! Red Tomatoes - The beefsteak tomatoes are here! These plants were seeded way back in May and it took all this time for them to grow and produce fruit. Enjoy! Storage: On the counter. Uses: Raw/Cooked. When to use: Now! Sungold Cherry Tomatoes - These little guys are perfect to pop in your mouth or throw in your favorite salad, Yum! Storage: On the counter. Uses: Raw When to use: Now! Zucchini - We're now harvesting from our last zucchini planting. Enjoy them while they last. Storage: In an airtight (plastic) bag in the refrigerator. Uses: Cooked. When to use: Within a week. Swiss Chard - The summer green is back! Have you been craving dark greens as much as I have? I still love it best gently steamed and served with olive oil and salt. But the garlicky recipe from the NY Times below is great too. Storage: In an airtight (plastic) bag in the refrigerator. Uses: Cooked. When to use: Within3 days. Cabbage - One more week of cabbage this summer. They will store well in your fridge if you wrap them well. And if you're like me and you already have a head hiding in the back of your fridge, put it in soup! It's a great way to use it up and it's super delicious! Storage: In an airtight (plastic) bag in the refrigerator. Uses: Raw/Cooked. When to use: Within a week or longer if stored properly. Red Batavian Lettuce - Thanks to the farmers for giving us lots of lettuce all summer long. It's hard to grow lettuce in this heat because it tends to bolt, which means that the center of the head shoots up and starts to go to seed... Timing the harvest is essential and not always easy. Please be sure to remove the fruit from the bag immediately when you get them home. They should ripen sitting out on a platter or on a dry dish cloth. Please remember just one bag per fruit share member.